“January 13, 2018…. what a day. It was a beautiful Hawaiian morning just like any other. I woke up in Maui shortly before dawn for a short 45-minute flight out to Kauai that morning. I had spent the entire month living on the islands and loving life…. then I quickly learned to love life a little bit more. As soon as we touched down at Lihue International, I turned my phone on (because I can’t go more than an hour without technology) and instantly noticed something was wrong. Remember those old TV interruptions? The alerts that would say “this is a test of the Emergency Broadcast System”? Remember the terrifying alarms before the voice would speak? Imagine a similar sound emanating from your phone as loud as possible. (Bet you didn’t know they even did that, did you?) NOW, imagine that sound coming from a hundred cell phones at once. In a plane. On the tarmac. And I looked down and read it: BALLISTIC MISSILE THREAT INBOUND TO HAWAII. SEEK IMMEDIATE SHELTER. THIS IS NOT A DRILL. I audibly read that last sentence out loud for everyone in the cabin because once the alarms rang, the rest of the passengers were dead silent. I thought I was going crazy. I thought it was a dream. And then it hit me: I need to call people. I need to say goodbye. I wondered if this is how people on 9/11 felt when they realized their plane was hijacked. Then I tried to call my best friend Chris. Nothing. No dial tone. In less than two minutes, the cell phone towers were already jammed. So I sent a few texts out basically rehashing what I said in my mom’s voicemail. We pulled up to the gate. We sat there wondering if the plane would just take off again into the safety of airspace–it didn’t. And as soon as the plane door was opened, everyone ran for their lives. People ripped their bags out of the overheads. They were sprinting through the airport calculating their next (and possibly last) decisions. Parents running with children in hand, bags barely holding up on their shoulders. I ran to security looking for a basement, shelter, ANYTHING. TSA stared at me and then slowly shrugged. Helpful. I made it to baggage claim only to see more people sprinting outside, people screaming, others abandoning their suitcases left to quietly circle the carousel–as much chaos as you could imagine. Where would the missile strike from? Where was it headed? Was it just Kauai that got the text? Did anyone else get the alert? Is the missile headed to another island? Was it North Korea? I remembered reading eerie news about air raid sirens being tested at Waikiki weeks before. I remembered the tension between our countries. But all I had was a ton of speculation and not a single answer. Then I reminded myself I needed to do something. 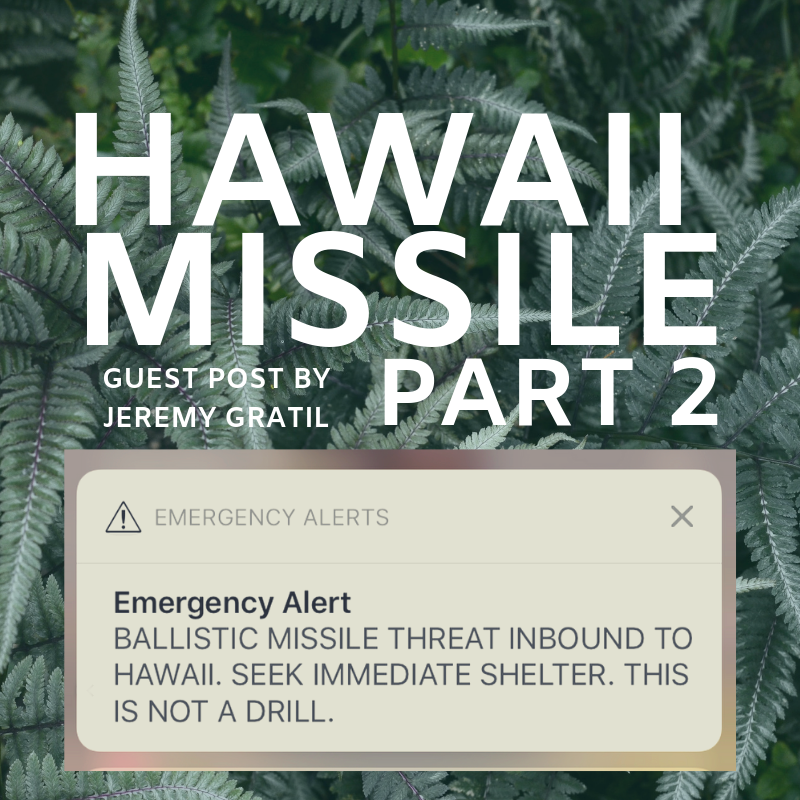 And (because of the nihilist I am) I reminded myself that the island of Kauai specifically possesses a large majority of US nuclear weapons–so the odds of a missile being sent to blow up a bunch of other missiles was highly plausible. My death was arriving early. I spent the next 45 minutes preparing myself to die in the most glamorous way imaginable. Alone. In a public men’s bathroom. Silently scrolling through my phone to search for any indication of when those four walls would cave in on me. After 45 minutes, I finally saw a tweet that the whole text was a terrible, horrible mistake. As cheesy as it sounds, that single event really did put life in a new perspective for me. Sure, it was an extremely rare traumatic event that (hopefully) will never happen again, but it also made me appreciate life that much more. Nowadays, it’s rare for me to go a few days without recalling those events. It showed me how delicate life is, how quickly things can change, and how important it is to take advantage of every opportunity to create a life I want to live. You can check out Jeremy’s website here & you can also get some amazing Oahu food recommendations here.